is a beautiful, powerful woman. conquistadors introduced tobacco... to the European nobility... in the 1500s. he is able to show off a little bit. Women smoke cigars for the same reason. or a romantic femme fatale. savored… a cigar gets finer with age... if kept in the proper humidor. and now... rather than on the demands of a busy schedule. of flavor nuances... to the discerning palate. were male-dominated for so long, they also experience more stress. They have more disposable income. Women are less afraid of embracing typical male pastimes for relaxation, like smoking a fine cigar. and achievement. People yearn for old established rituals... rituals of elegance and sophistication, of good-fellowship and camaraderie. Women add a certain "Class" of their own. Women Love the "Smooth Tasting"
with every slow draw of smoke. "sun kissed" fields... to the rolling tables. controlled humidification room, before releasing these exclusive cigars. one of our Vegas Chiquititas... you will smoke no other brands! that will leave you craving for more! These cigars are a labor of love for our Cuban master blender Don Louis Santana, who has been able to produce such an intensely flavorful smoke that appeals to the most discriminating smoker. From the deep Rainforest… to the warmth of the rich volcanic Earth… rises like a "Phoenix from the Ashes", the legendary and rare "Vegas de Santiago" Premium Cigars from Costa Rica! 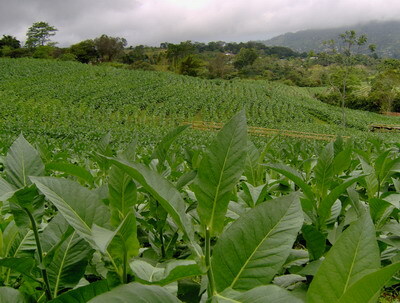 Our tobacco is grown in the fertile, high volcanic mountains, at a height of 1100 meters above sea level, in Santiago de Puriscal. The special conditions here allow us to grow our tobacco with very little use of pesticides and artificial fertilizers. We also quick-freeze our tobacco leaves, before and after curing. Our special tobacco is then hand-picked, selected, dried and cured for 3 years with tender loving care. In Costa Rica, this is called "Pura Vida", Pure Life! Where the tobacco plant is considered most sacred. The Manufacture of "Vegas de Santiago" cigars is all done by hand, using the tubing technique after "de-veining" the leaves. Our rich and smooth wrappers are imported from plantations in Nicaragua, shade-grown to perfection. The Mystique of the Rainforest lingers in the smoke…. 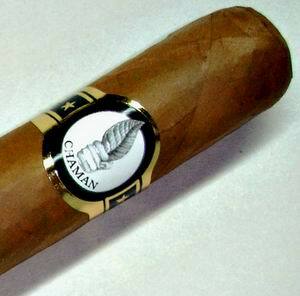 and the mild, smooth taste will convince you of the high-quality of "Vegas de Santiago" Premium Cigars. our customers their own custom cigar bands. for Prices and Styles of Cigar Bands! Please email us... with any questions you may have. Sunny Greetings from Costa Rica! fingers from getting stained with tobacco. Empress." The actress was often seen smoking cigars. cigars with her friends, Ernest Hemingway and F. Scott Fitzgerald. and the Australian soprano Nellie Melba, all enjoyed a fine cigar. from this factory were sent to Nellie Melba. 1992, is the largest women's cigar smoking society. relieved some of the stress of their jobs.. by smoking cigars. more than GI's lockers... with her cigar smoke. with their names in the headlines... and cigars in their relaxation kit. for more than forty percent... of the retail cigar dollars. de Santiago Premium Cigars from Costa Rica. than liquor, drug or grocery stores. smell good, it won't taste good either. macadamia nut... to name a few. exception... is the exquisite "Chiquititas" from Vegas de Santiago! Don't inhale. Cigars are for enjoyment, not a quick nicotine fix. at smoker-friendly places, cigars are often prohibited. What is so alluring about the Cigar Woman? What makes her so damn attractive... to cigar-smoking men (and even to many men, who don't smoke cigars)? First of all, there is a certain strength about a cigar smoking woman. She is someone who is self-confident, secure and ready to fly in the face... of the criticism... of her family and friends. She stands out. Men like women... who aren't afraid to break rules... and take risks. They know these women... just might rock their world! The image of a woman... holding a long, sleek, cylindrical object... in her mouth, prompts even the most sophisticated men... of the world...to be reduced to drooling newborns... in suits. If you haven't already realized it, there is a whole new mode of meeting men... that has been born in the 1990's. Cigar parties, single-malt scotch and cigar tasting, cognac tasting, beer tasting and the like, are predominantly frequented by men.... lots of men. These events do not exclude women. However, it has been my experience... that rarely more than two or three women... are in attendance, and every man... in the room... is keenly aware of the presence... of those few smart, lucky ones. If you come to one of the tasting or parties, be prepared to be scrutinized. However, you will also be fawned upon, flirted with, wined, and if you wish, dined, if not worshipped, by your pick of men. They will compliment you, show you respect, and perhaps best of all... offer you cigars. Your only challenge... will be to figure out... who is married, and I suspect... you've all had some practice at that. To Learn the Secrets... of our new "Shaman Cigar"
International Fine Wines & Liquors, Information about Wines & Wine Testing. Cocktail Recipes! Tropical Drinks! Gourmet Foods! Gourmet Cooking! Gourmet Recipes! Tiki Bars, Tiki Huts, Tiki Glasses, Mugs & Gifts! 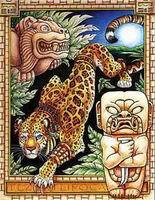 Tiki Masks & Statues, Tiki Art! Cocktail & Wine Glasses & Accessories! where we not only talk about VdS cigars, but also offer FREE Samplers of new creations from time to time for reviews. Revised: 02 Dec 2008 14:03:34 -0600 .